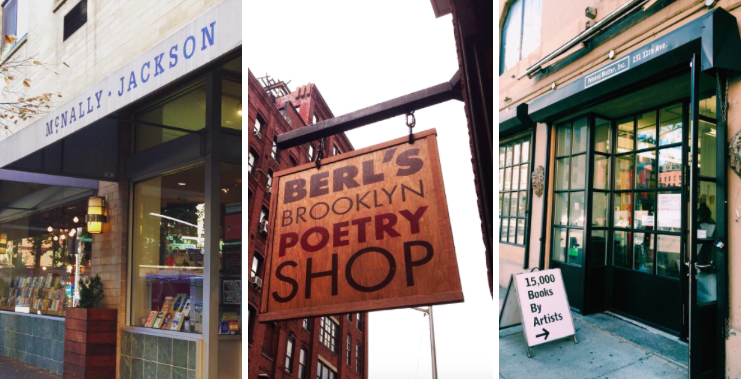 As part of our literary city guide series, we’ve mapped out the literary landmarks, bookstores, writers and books of contemporary New York City. No one moves to New York without dreaming of being a writer. Or, rather, as others have said, “no writer moves to New York without producing a New York novel.” New York is the literary capital of the world. We said it, and we can prove it. Many of the world’s most famous writers congregate and reside here. It contains multitudes of hyper-curated bookstores and libraries and literary centers, not to mention most of the country’s publishing houses. You can attend a book launch or a poetry reading or both every night of the week, only to become a victim of the New York literary hangover, or as Lorca warned in a poem about the city: “growing too much moss on your temples during the night.” There’s plenty of writers’s haunts to find a cure of the dog, just don’t end up like Dylan Thomas, who died after famously drinking 18 whiskeys in a West Village tavern. As there is just too much content for our trim guides, we’ve provided listings at the bottom of the list in case you want to scout out more obscure landmarks. One of the most storied hotels in the country has rooms for rent in New York’s Chelsea neighborhood. It’s literary heritage is rich enough to fill a book of its own—Mark Twain, Jack Kerouac, Simone de Beauvoir, Dylan Thomas, Patti Smith, and a score of musicians and artists. You can now stay as a guest at the hotel, it was renovated in 2012. Edgar Allen Poe’s house sits in a park in the Bronx and is available for tours that feature his austere accommodations, including his writing desk. Back in Manhattan and Brooklyn, the Literary Pub Crawl offers guided tours of the many former literary haunts and houses that dot the two boroughs, such as the White Horse Tavern where Dylan Thomas famously drank himself to death. Must-sees for any poet visiting the city. 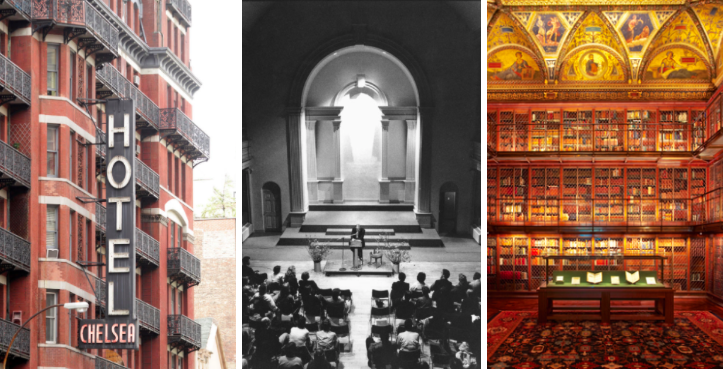 St. Marks has been the nerve center for New York poetry for over 50 years, with a celebrated reading series and zealously followed newsletter. If you haven’t heard of many of the scheduled poets, a stop downtown at Poets House—a library and center devoted exclusively to poetry—will remedy that. Not only is the art of book making alive and well in the city, but right in the heart of Manhattan is an institution dedicated to preserving the history of and continuing the culture of book arts, a short walk away, The Center for Fiction, the only American non-profit dedicated solely to fiction, offers daily workshops and events. “18 Miles of Books” is what the largest bookstore in NYC promises. Here you can find both thousands of used and new books, along with a entire floor of rare tomes. Feel free to ask the staff stationed at help desk throughout the store about the most obscure titles—all employees are required to pass a notorious literary knowledge questionnaire. One of the most celebrated independent bookstores has a healthy selection of books from all genres and origins, including a fiction section divided by global region, and non-English books. McJ has cultivated a large Spanish-language readership and hosts major book launches in both English and Spanish. New York’s leading left-minded bookstore, Bluestockings is a volunteer-run and collectively-owned shop dedicated to all activist topics with a particular emphasis on feminist works. If you’re looking for samizdat political zines, or radical literature, this is a must stop. One of the few bookstores in the country solely dedicated to poetry, Berl’s is a must-visit for an enthusiast for verse. Chapbooks, perfect bound books, broadsides, they’re all here. The owners themselves are both poets, well-connected in the poetry scene, and host plenty of readings at the store. The store for unclassifiable and art-minded publications. Printed Matter is both an archive and a store filled with a richness of ephemeral literature, poster-sized prints, and hand-numbered (and often hand-bound) collector’s editions. Printed Matter also hosts the New York and Los Angeles Book Art Fairs that have grown from niche festivals to major events. 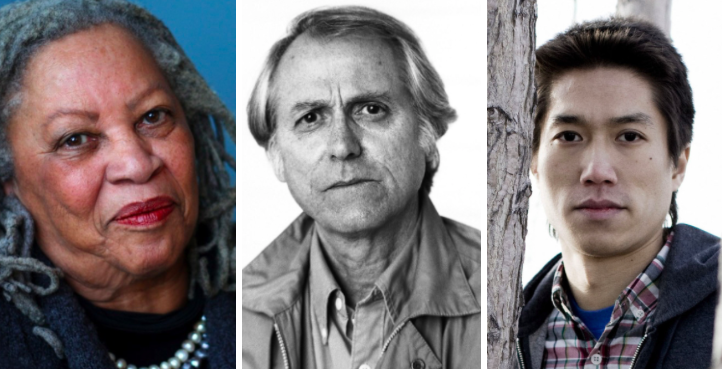 If New York had a poet laureate, it would Eileen Myles. For the past forty years, Myles has been a touchstone of the New York poetry scene. In the 80s, she became the director of the venerable St. Marks Poetry Project where she was essential in ushering in a new generation of New York poets. She is notable for her LGBT advocacy, and in the early 90s, Myles ran as an “openly-female” write-in presidential candidate. Her definitive collection I Must Be Living Twice: New and Selected Poems published in 2015, was hailed as a literary event and the poet herself, a cultural icon. Morrison is one America’s most lauded living writers. She wrote her first novel, The Bluest Eye (1970), while raising two sons and teaching at Howard University. She later became an editor at Random House, helping the publishing house cultivate a stable of African-American writers. Her novel Beloved (1987), about a runaway slave, made a sweep of many major literary awards, including the Pulitzer and later the Nobel in 1993. She was awarded the Presidential Medal for Freedom in 2012 and published her latest novel God Help the Child in 2015. A poet by origin, Lerner turned heads with the publication of his surprise sleeper hit first novel Leaving the Atocha Station, in which Lerner fictionalized events from his own life. He has since become one of the leading names among a new generation of auto-fiction writers, an genre that mixes memoir with fiction, which was furthered explored in his great New York novel 10:04. Lerner’s poetry collection Angle of Yaw was a finalist for the National Book Award in 2006. He also is the author of the book-length criticism The Hatred of Poetry. Few writers have grasped the existentialism of millennials like Tao Lin. His books of poetry and novellas have been classified as harbingers of “alt-lit,” a literature of the daily mundane and the internet obsessed. His first novella Shoplifting from American Apparel drew comparisons to the early writing of Douglas Copeland and Bret Eason Ellis, while his latest novel Taipei showed Lin mature his storytelling. He has been the subject of several profiles and has not been stranger to controversy. A selection of tweets from his popular twitter account was published in 2015. Delillo is a New Yorker’s novelist, a writer who is not only capable of capturing the nuance and idiosyncrasies of the city, but with the intelligence and wit that New Yorkers pride themselves on. His debut Americana is widely considered one of the great post-modernist novels of the 1960s. His great middle period began with the satirical campus novel White Noise, continued with Mao II, a portrait of gritty 1980s New York and culminated in Underworld, which examines NYC through several generations and voices, and Falling Man, a 9/11 novel. Arguably the great post-modern New York crime novel, Sergio De La Pava’s A Naked Singularity emerged from the dregs of self-publishing to become a prize-winning cult classic. It follows Casi, a New York public defender whose clients are society’s unfortunates. Casi is befriended by a fellow lawyer named Dane who, through Socratic-like dialogue, convinces him on committing a perfect crime. While this is being plotted (and later executed), Casi drifts within a surreal-like environment of madcap neighbors and proud Colombian family members. 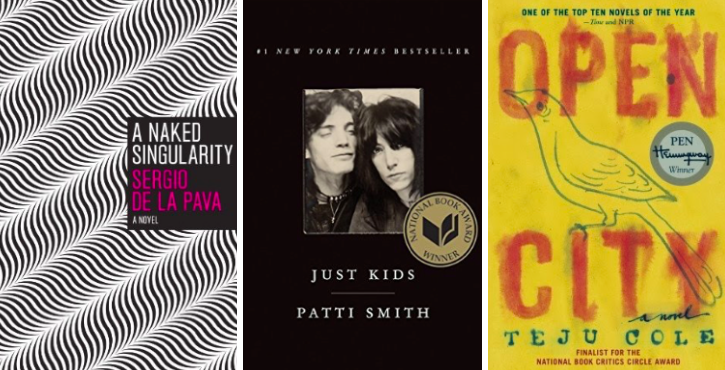 That New York is romanticized by the many artists and writers who come here goes without saying, but perhaps no one better captured that mood than Patti Smith, whose memoir Just Kids follows the musician as she struggles hand-to-mouth to make it in the city along with her lover and later friend Robert Mapplethorpe. The two begin on the outskirts of Brooklyn and eventually find housing in that storied residence the Chelsea Hotel through which a fleet of names pass. As Smith charts her rising career, so to does she capture a changing city that she can eventually call home. One of the more meditative New York novels out there, Teju Cole’s debut novel Open City is written in a deep Sebaldian style as it follows a Nigerian-born med student named Julius who wanders around the island of Manhattan considering both his surroundings and his relationships with people past and present. Through Julius’s narration, Cole is able to provide a fresh and vivacious look at the contemporary city, though it’s ending will cast Julius in an unexpected light. What’s it like to be a young, gay Muslim woman immigrant growing up in New York? That’s the premise behind Tanwi Nandini Islam’s debut Bright Lines, in which the protagonist Ella, the niece of Anwar and Hashi Saleem, comes to terms with her burgeoning identity. Set in Brooklyn (with parts in Bangladesh) in 2003, Ella has come back to live with the Saleems and their daughter Charu. The past and present both haunt the family, as events in Bangladesh and developing and suppressed romantic urges began to wear upon them. Poetry thrives in New York; it always has. Allen Ginsburg, Frank O’Hara, Barbara Guest, John Ashbery are among the hallowed names of the cities bards, who grow in number with each generation. This anthology is one of the better gatherings of poems about New York and offers a great overview to many of the names that have kept the art form alive both through practice and execution of verse. * This guide pulls from preexisting listicles curated by Kirsten Nicholas and Ashley Jones for Culture Trip. As these previous lists may include items not shown here, links to these pieces have been hyperlinked in section titles.